Do High-Skilled Third-Country (i.e. Non-EU) Migrants Contribute to Productivity Growth? In order to foster innovation and enhance economic development and growth, attracting skilled professionals from abroad has become an important policy goal in many economies, initiating a global race for talent. 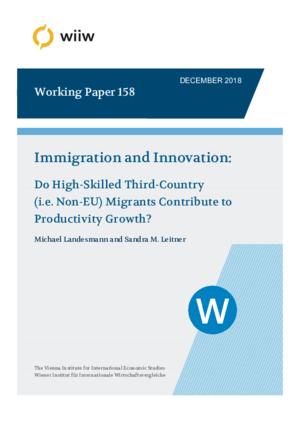 This paper looks at the private company sector in a group of 13 old EU Member States and examines the role of high-skilled third-country (HS-TC) migrants for innovation – as captured by real labour productivity and total factor productivity (TFP) growth – between 2004 and 2015. It utilises four different indicators of HS-TC migration and defines high skills in terms of either educational attainment (ISCED classification) or the skills required in an occupation (ISCO classification) which helps identify the presence of a jobs-skills mismatch for HS-TC migrants. Taking into account the endogenous nature of HS-TC migration, we find some selective evidence of a negative causal link between the share of HS‑TC migrants, on the one hand, and labour productivity and TFP growth, on the other. Furthermore, differences in the results for the ISCED- and ISCO-based skills measures point to a non-negligible jobs‑skills mismatch in terms of an over-representation of HS-TC migrants in lower productivity occupations. We also find that HS-TC migrants are relatively less productive than HS EU migrants. Results for selected individual industries are more mixed, with some industries even benefiting in productivity terms from a higher share of HS-TC migrant workers.